Drink mix for life-long Pauling therapy maintenance. 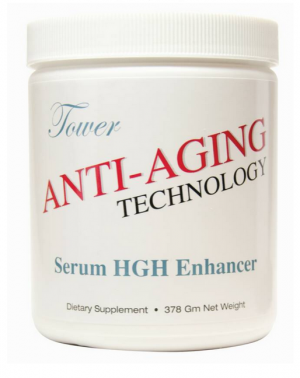 Tower's Anti-Aging Technology is a nutritional complex whose ingredients have been shown to stimulate HGH production by the pituitary gland in some people, especially in the absence of light. One jar contains a 1-month supply. Mix 1 teaspoon with 8 ounces of water twice daily. Take in the evening and sleep in a dark room. Ingredients Per Daily Serving: L-Arginine 3,000mg, L-ascorbic acid (vitamin C) 3,000 mg, L-lysine 1,000 mg, L-ornithine 1,000 mg, L-glutamine 2,000 mg, glycine 1,000 mg, D-calcium pantothenate (B5) 200 mg, pyridoxine HCl (B6) 10 mg, and stevia 60 mg.
DO NOT TAKE THIS PRODUCT AT THE SAME TIME AS TAKING ANY OF OUR OTHER PRODUCTS WITH HIGH LYSINE. TWO SCOOPS OF ANTI-AGING MAY BE TAKEN AT BEDTIME APART FROM DOSES OF EITHER HEART TECH, ASCORSINE-9, OR CARDIO ADE. 100% money back guarantee within 60 days of original shipping date. Refrigerate or freeze product before and during use for longer shelf life.